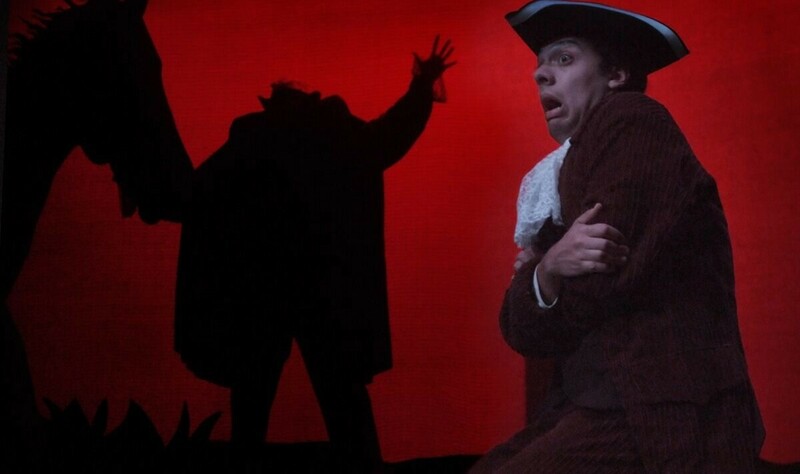 Kyle Baran plays Ichabod Crane in Theatre of Youth’s spine-tingling production of “The Legend of Sleepy Hollow,” which runs through Oct. 25 at the Allendale Theatre. Another Halloween season is upon us, and so, another attempt at scaring the flipping wits out of each other. Theatre of Youth does a swell job with its season opener, “The Legend of Sleepy Hollow.” The show haunts, chills and places general fear in anyone who dares walk alone at night. The single-act drama, directed by company leader Meg Quinn, is taken, of course, from Washington Irving’s legendary short story. When simply retold, the story sounds rather tame, at least by today’s fear-inducing standards: schoolmaster Ichabod Crane comes to the innocent Dutch settlement of Tarry Town, and quickly finds himself haunted by a headless horseman, the legend of you-know-who. A jack-o’-lantern is where his head should be, instilling reasonable fright in the churchgoing people of Tarry Town, whom we can be sure would rather be carving and cajoling among the squash than running from it. Quinn’s staging does a fine, if labored, job getting us scared. It takes a good while before there’s a chill in the air, though the devil’s advocate might point out that in contrast, the layered storytelling mimics the rhythm of a true ghost story. I imagined this being told around a campfire, tension in the darkened air, and still thought it lagged a bit up front. Either way, the show feels best for the rapt reader in your household, rather than the horror-movie fan. Kyle Baran is our Ichabod Crane, a lanky, superstitious fellow who ought to be a little more peculiar than Baran lets on. Ideally, Crane’s idiosyncrasies would throw us off a bit more than Baran does, goofy and comedically tone-deaf a singer as he is. Similarly, Jacob Albarella, as Brom Bones, Crane’s would-be nemesis (regarding the pursuit of pretty Katrina, played by Marissa Biondolillo), is perhaps not as richly devious as he might be. Both characters have the potential to fool, or even just distract, the audience from the real mystery of Sleepy Hollow’s identity. Here, they lack the little bit of fire or flair that might feed our suspicion. On a different, though related, note, Larry Smith, as Pastor Can Tassel, seems out of place. His dry-witted temperament is the most modern of the eight-person ensemble, which doesn’t quite stand up in this environment, even with a fair amount of wink-nod humor. He gave me a hint of parody in the opening scene. His appearance is brief and rather inconsequential, though, so no real harm done. The rest of the ensemble is a treat, namely Reed Bentley, Priscilla Young Anker, Jennifer Fitzery and Gerry Maher, all of whom evoke the kind of enchantment and paranoia we’re used to in these grim stories. Fitzery and Maher, in costumes by design demigod Ken Shaw, especially, look completely natural in this dark wood. It may sound like a broken record at this point, but Shaw is once again the unsung hero of this production. Quinn’s company and her direction, especially, are certainly appealing; she uses the whole auditorium as her stage, to great effect. But it is Shaw’s holistic treatment of the theatrical space that makes this truly interactive. Canopies of torn fabric, lit beautifully by Todd Proffitt, will give your little ones a lot to take in and question. As always on the Allendale stage, it’s imagination that’s the real star of the show.